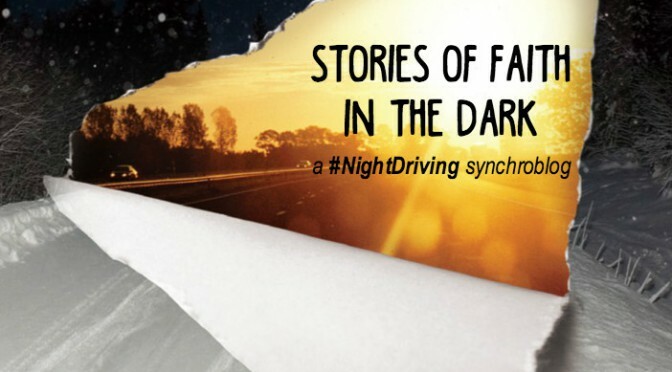 My friend Addie Zierman asked her readers to share their stories of faith in the darkness to mark the release of her new book, Night Driving: A Story of Faith in the Dark. I highly recommend her book and have already shared about it, but I wanted to take up her challenge and write my own story. This is not an easy story to share, as you’ll see. There’s more I could confess. There are other, different, arguably more important perspectives. But this is my perspective and the only one I can share. I ask your grace and mercy in sharing this, not for me alone, but for everyone who had a part in this season. The darkest season in my life started with a nine hour stay at the emergency room. That night—well, early morning I guess—we came home without our daughter. We would see her again, but she never came back to our house. This is the story of a disrupted adoption. That’s safe, clinical language for an adoption that falls through. You welcome a child into your home, make her a part of your family and do everything you can to convince her that this is a permanent and lasting home. And then you kick her out. It’s the antithesis of everything adoption is supposed to be. And it’s what my family went through in 2011. I remember driving home from the hospital and passing a wrecked car abandoned in the street. There were no police. No flashing lights. No people standing around. Just a mangled car. Broken glass littered the street, catching our headlights and throwing pinpricks of glare into the early morning dark. It looked like someone crashed into a parked car and then drove off. I don’t like helping my kids with their homework. There, I said it. My parents never had to harass me to do my homework. I just did it. I was annoyingly responsible. To the point that I spent Friday nights in college getting a jump on papers. My wife still makes fun of me for that. But I feel no sense of responsibility over my kids’ homework. It’s their homework. They need to be responsible for it themselves. It’s the day before Thanksgiving, the busiest travel day of the year, and for the first time since high school I’m not traveling anywhere. I guess 1996 would be the last year I didn’t go anywhere for Thanksgiving. In college I always drove the 700 miles home to Michigan. Once married, we alternated Christmas and Thanksgiving between our parents in Wisconsin and Kansas. The former was only a 300-mile trip, but the latter was another 700-mile full day in the car. So I’m pretty used to traveling on Thanksgiving. On the years I made the 700-mile drive I’d get up at some ridiculous pre-dawn hour so I could be on the road early and make good time. The alarm would go off at something awful like 4:30 and I’d be on the road by 5. Except I could never sleep well before long drives and would always be up before my alarm. No matter how early it was. I couldn’t sleep this morning either. No alarm was set, but I was awake by 5. Some habits die hard, I guess. This year we decided to stay home for both holidays. Last year we somehow ended up traveling every other weekend in November and December and we just couldn’t handle it this year. Too many miles, too much whining from the back seat, too much stress. Plus, the idea of having our own holiday and forming our own traditions sounded pretty great. We’ve never done our own holidays, so we haven’t forged many of our own traditions. Growing up we rarely went anywhere for the holidays. We had fairly set traditions, like going to cut down a Christmas tree the day after Thanksgiving and setting it up that night. Watching Ernest Saves Christmas on Christmas Eve. OK, so sometimes family traditions are weird. But that’s what’s fun about them. Through the years I’ve always been thankful that I had a place to go for the holidays. No matter what happened that year, no matter what life transition happened (and there were a few, between getting married, watching my parents get divorced and seeing them get back together), I always had a place to call home. A lot of people aren’t so lucky. I’m also thankful that for all those miles traveled I never had any major car trouble. It always seemed like a minor miracle that I’ve never been in a big accident, never had my car break down, never had a flat tire. I’ve had my share of close calls. I hit a bird in Chicago once. A jet ski fell off a trailer just in front of me. It wasn’t a holiday, but on one snowy drive I did lose control and fishtail into a ditch, but I was nearly able to drive out of it. Plus my parents were there to help push me out and we were back on the road like nothing happened. Later that day on the Interstate I watched the truck in front of me start swerving and spin 40 feet off the road into deep snow. Last year I drove several hundred miles to Thanksgiving with the check engine light on, worried something bad was going to happen. But all systems were go. I’ve had some close calls over the years, some diverted plans and some travel sickness I’d rather not detail, but we’ve always made it. I’m incredibly thankful for that. I have a lot to be thankful for at Thanksgiving. This year it’s going to be staying home and doing nothing with my family. Forging our own traditions, like the day before Thanksgiving donuts (it’s a thing) and setting up our Christmas tree the day after Thanksgiving (some traditions are meant to endure). It seems like only yesterday Lexi was heading off to her first day of kindergarten. She was over-the-top excited and Milo burst into tears. 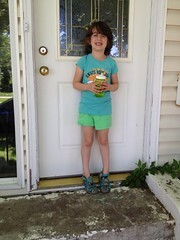 Today was her last day of kindergarten. She’s older, wiser and taller. The last day celebration included a cookout with Pete the naturalist at the Dodge Nature Center, featuring mini hot dogs (Milo ate half the pack) and pizza. Then we headed back to school to hear about some of her favorite things from throughout the year and every student received an award for following one of the school’s five overall rules. Lexi was recognized for “safety,” because she always brought the right gear. I think that means I should get an award for sending my kid to school prepared (which usually meant stopping her on the way out the door and insist she wear something more appropriate). She also got the award for making sure everyone else was being safe too, which I’m pretty sure means she’s just bossy. She practices all day long on Milo, so it’s good to see it’s paying off. It’s been a fun year watching Lexi grow. I think the social aspect of kindergarten—learning how to interact with other kids, following the rules, being prepared—has probably been the most important, though it’s also been cool to see her learning the academics. She’s learning how to read, slowly and with more and more confidence. Having a kindergarten teacher for a mom, some people expect reading to be a serious and early milestone in our house. But it’s actually counter-productive to teach kids to read too early (Abby could give you all sorts of reasons why—I’ll leave that blog post to her). It’s important to let them go at their own pace. And it’s been fun to see that with Lexi, to see her start to read signs in stores and read stuff over our shoulder. She’s still gaining confidence with reading books, but she’s getting there. I’m also trying not to be too proud that one of her favorite things in school was writing. Finally, the end of the school year means the end of a little project of mine, the Days of School. It started with me taking pictures on the first day of school (I have an addiction to feed). Then as we waited for the bus on the second and third days of school Lexi kept asking me to take pictures. So we started taking a picture every day. I think we only missed one or two days when Lexi actually went to school, and of course we missed all the days she was absent (and since she had mono in the fall, there were a lot of those). But in the end we have 151 pictures of Lexi going to kindergarten. As we went outside to take her picture today I told her we were taking her last picture. She told me, “Nope, you’re taking pictures in first grade too!” So we’ll see how long this thing continues. 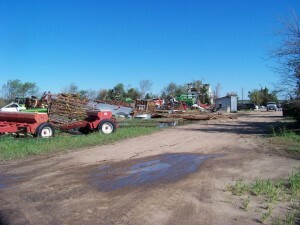 My uncle’s farm outside Raymond, Kansas, was hit by a tornado late Saturday night. Everybody’s OK, but the devastation is pretty complete. 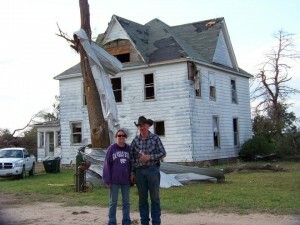 The farmhouse is still standing, but the roof was lifted up and the windows blown out, so that doesn’t mean much. While my uncle currently lives there, this has been the family farm. My grandparents originally owned the house and my mom grew up there with her siblings. My aunt was married there (I was the ring bearer in the wedding, though I seem to remember thinking I was the ring bear). When my grandparents “retired” (?) and moved to town, my uncle and his family moved in. My cousins grew up there and I have so many memories of going out to the farm. We’d play flashlight tag, truth or dare, light firecrackers, build forts in the old scrap iron pile and fight like siblings inevitably do. I don’t have a very good before picture, but here’s my grandparents standing in front of that same door celebrating their 25th wedding anniversary. And here’s my aunt standing on those very steps at her wedding. A little generational history at that old farmhouse. 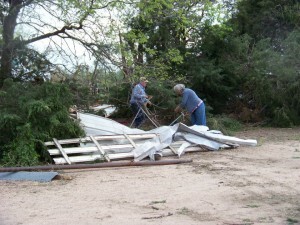 The devastation is much more complete away from the house. 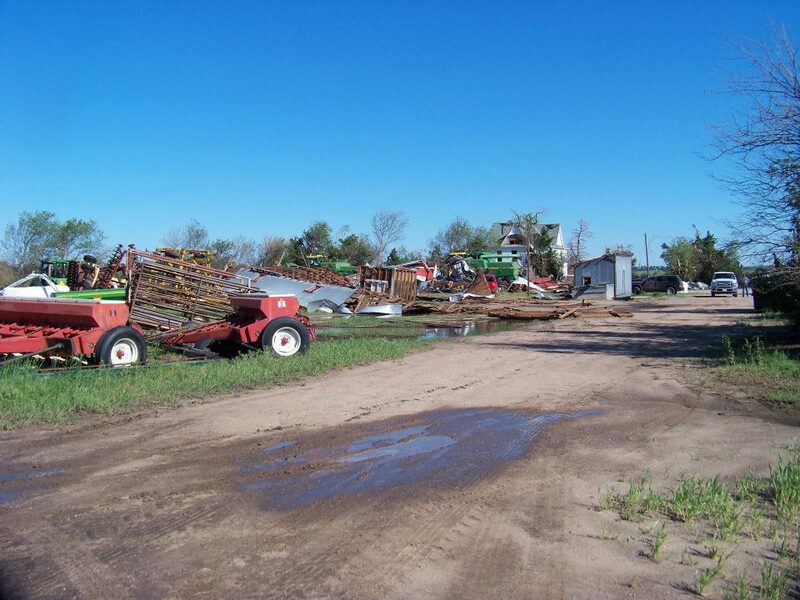 A giant machine shed and two-story wooden barn were completely destroyed. In this picture those buildings should line the left side of the road. In the distance you can see a combine and several vehicles that were lined up inside the shed, which is now completely gone. I remember that driveway feeling crowded with buildings. Not so much anymore. Now it’s mostly debris. A concrete silo was completely knocked down and debris is strewn all over, sheet metal wrapped around trees and even a pipe piercing a tractor tire. 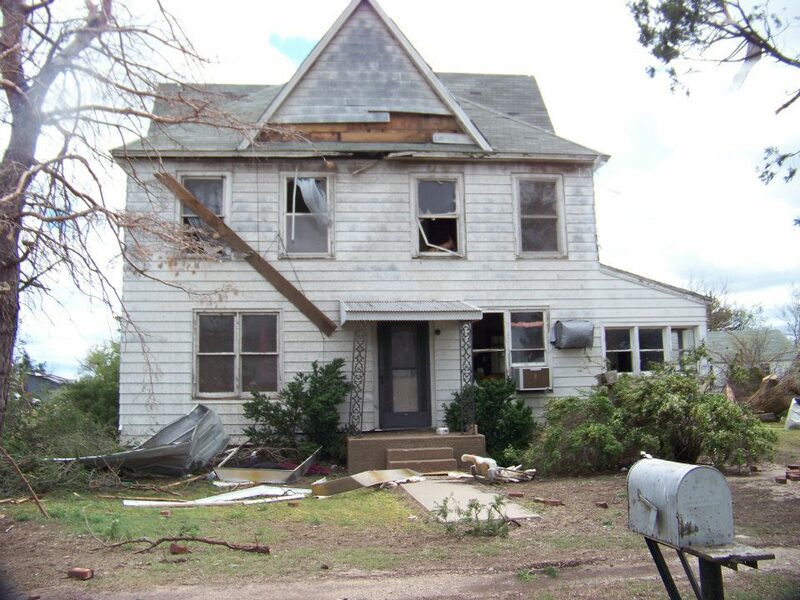 My uncle heard reports of a tornado near Raymond on the radio and made for the cellar. Five minutes later his ears popped, then there was a loud boom and then nothing but the sound of falling glass. That was it. This picture is probably the most brutal, my grandparents, picking through the debris. I don’t know what they hope to accomplish there, and maybe the futility of it is what makes it hurt all the more. Its just another storm to weather. After all, it’s just stuff. If you haven’t been able to tell, we’re going through some stuff right now. I can’t really talk about it here for a number of reasons. But I found myself commenting that I’ve been blogging for 10 years (12, actually) and I’m not sure if my blog will survive this. Aside from being too busy to blog, I’m finding myself unable to blog about other things. Everything else in life seems mundane right now. I don’t have the emotional energy to invest in anything else, so why fake it? But if a decade (and then some) of blogging has taught me anything, it’s that you have to press on. It’s taught me that the writing helps. It’s taught me that a lot of crappy writing has to come out, and that’s OK. This isn’t for you, it’s for me. In the midst of all of this the one thing I can say is that the only reason we’re still kicking is because we’re standing on the shoulders of giants. I don’t know how people go through crises like this alone. I couldn’t do it. Friends are stepping up and helping us, and not just in a vague, ‘we’ve got your back,’ way, but in a real, going around the world and back kind of way. And it’s not just a couple people or a handful of people. It’s a crowd. That’s humbling. I don’t deserve any of it. And yet there they are. And it’s a good thing, because it feels like it’s getting worse. We’re not out of the woods yet. We’re just getting started. Last night Yeshumnesh asked if I cried when my grandpa died. Actually, she asked if I would cry if Milo kept eating and eating until his stomach exploded and then he died. I tend to ignore those bizarre ‘what if’ scenarios and then she asked more seriously if I cried whey my grandpa died. He died in 2002 and I tried to explain that it was his time. I was sad to see him go, but he was barely hanging on. He’d grown so frail and skinny at the end. Medical complications were getting ridiculous and while I don’t remember it all, I think amputation had been discussed. That’s not something an 80-year-old man needs to go through. His death wasn’t unexpected, it was a mercy. Then I showed Yeshumnesh some pictures. 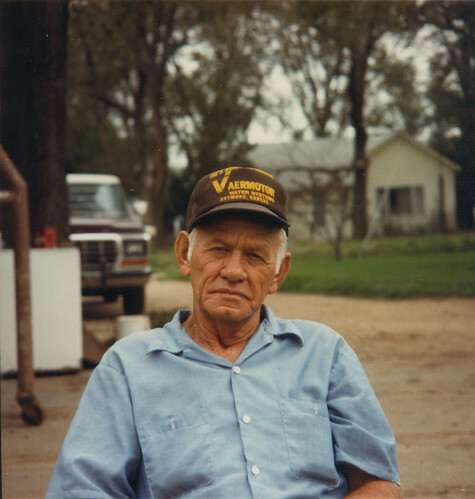 This is how I remember my grandpa. That and the fact that he called me ‘turd.’ If I had more time I would have explained to Yeshumnesh what I wrote for my grandpa’s funeral. I don’t think I’ve ever written anything else that so perfectly captures a person. That was Grandpa, making people laugh. While talking about him I realized none of my kids ever met him and even Abby barely got to know him. By the time she was in the picture my grandpa was already frail in body and mind. They all would have loved laughing in his kitchen. And that’s actually one of my greatest treasures—standing around in my grandpa’s kitchen with my brother and cousins and Abby, telling stories and laughing so hard. A line I wrote nine years ago sums it up: He grew too old before I grew up, and I miss him. This picture captures him so perfectly, I can almost smell the Old Spice.